Welcome to Farmscapes! In time for summer, there is a bored kid who is sent off to 'farm camp' with his grandpa after his parents notice that he plays too many video games during his free time. Armed with a sense of humr, an eye for business and a desire to keep things neat and clean, you accompany Tom to his grandpa Joe's farm to make something out of the charming but poorly maintained place. Playrix is one of my aboslute favorite publishers/developers when it comes to casual games. Their games are beautifully designed and highly polished, offering more than your usual time management or hiddn object title. Farmscapes HD (Premium), which was free for a limited time, is no exception. In this game, you help a kid and his grandpa restore his rundown farm into a beautiful and financially productive entreprise. How, pray tell? Farmscapes HD (Premium) combines match three with hidden object gameplay in order for you to buy the necessary equipment and decorations to improve your farm. Matching at least three of a kind is used to sell your wares to the local townfolk. Your wares form the 'units' that you have to mix and match – ultimately, you have to eliminate golden tiles scattered across the board in typical match three fashion. Later on, when you unlock new equipment/animals such as bees and livestock, you add units to the board. Each match three level is equivalent to a day at the market, and as a nice touch, people walk past and make all sorts of comments while buying. 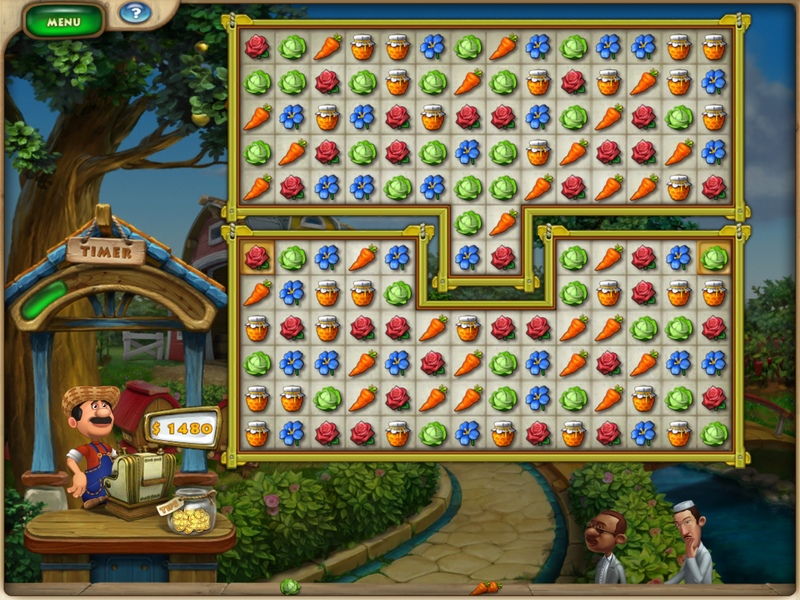 Once in a while, you have to perform certain tasks and solve simple puzzles at the farm. These are usually connected to looking for hidden objects. 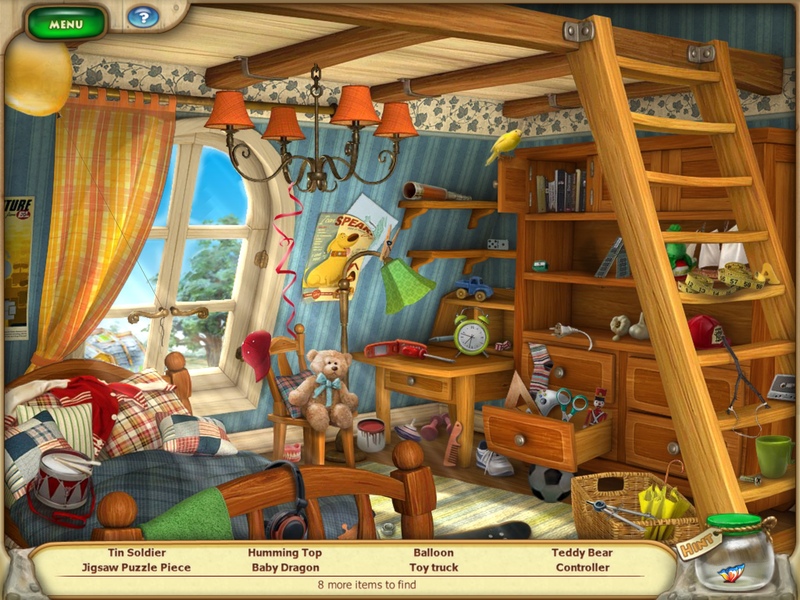 The hidden object aspect of the game is pretty standard fare, but done very nicely. In the match three game, you earn money based not just on the gold tiles you clear, but the time bonus and tips you earn. Eventually, the match three part becomes quite difficult, and sometimes tiles have to be reshuffled just to make a match. The harder the game the smaller your time bonus. At the same time, the higher the levels, the more expensive the upgrades. 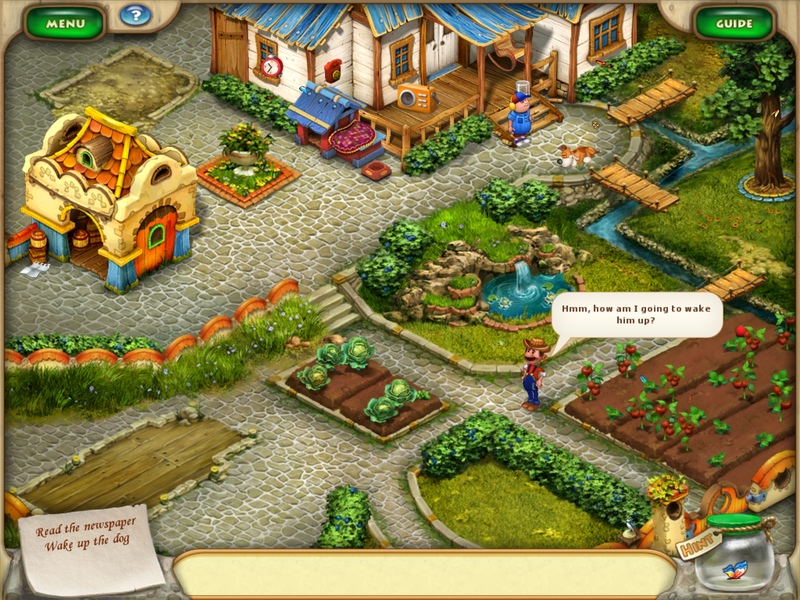 What makes Farmscapes HD stand out is its sense of humor and interactive elements. You can tap on the characters and they will have a funny line or two. You can also just watch Tom and Grandpa Joe exchange witty jokes. At the same time, there are occasional neighbors who drop in for some conversation. Others leave letters that are basically tasks you need to fulfill. 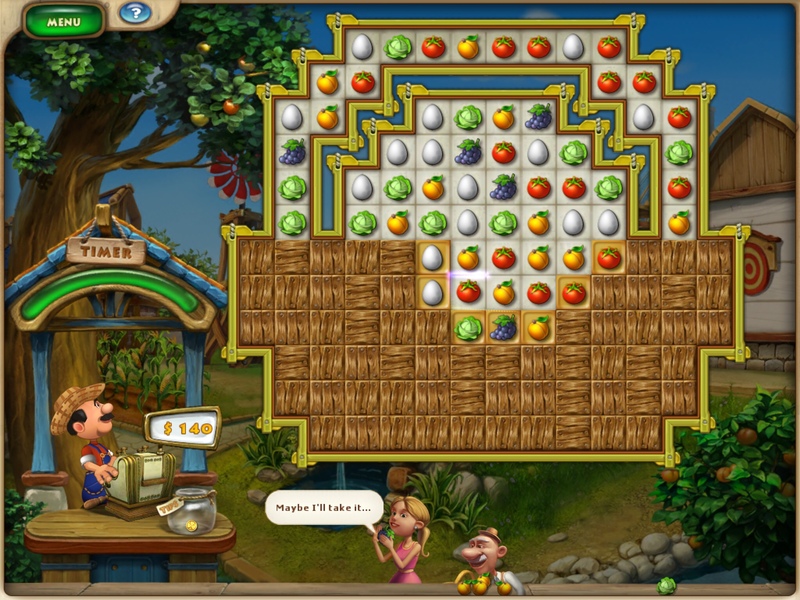 The makeover aspect is similar to Playrix's other games, and it basically offers a lot of options to suit different styles and preferences. There is also a formulaic storyline involving keeping Grandpa Joe's farm running and not selling it, despite a real estate developer planning to build a mall next door. 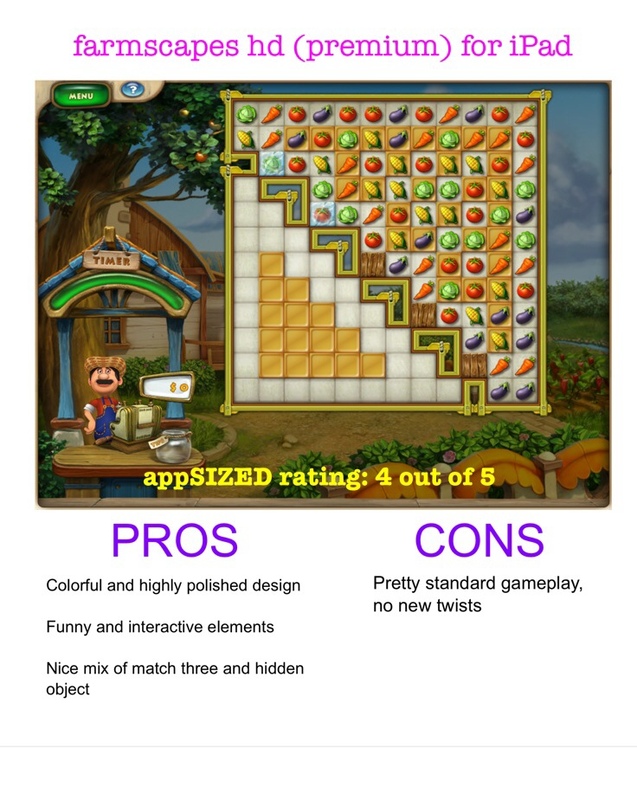 Overall, while Farmscapes HD offers your standard match three or hidden object, the overall package is very attractive and the little touches make this game a fun and engaging experience.